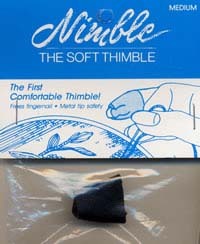 Puts sewing comfort at your fingertips. Self adjusting soft leather conforms to the shape of your finger. Stretch control for long lasting fit. Sensitive supple as a second skin, lets you feel the needle. Sturdy protective metal tip so needle glides through thickest fabric.